And, frankly, I trust I’m not the only one, who now watches in amazement at his relatively quick development. So, to confirm my recantation, I was inclined in this space to hyperbolize as to how his entry into last evening’s 72-58 thunderation of Syracuse was the turning point. How his follow shot of his own miss to pull the Cards within 21-22, and how his jumper twenty seconds later, handing U of L its first lead of the tilt, how those two dazzling plays kickstarted the Cardinals’ rout, energizing both teammates and the theretofore laid back crowd. While, it was a beauteous interlude, and further confirmation of my inability to assess talent in the same manner as, say, a Hall of Fame, twice national champion coach, Stockman’s spotlight moments were more an exclamation point for the Cards first half awakening, not the catalyst. Let’s be clear about last night. In the beginning, the Cardinals were dreadful. I turned Doug Ormay, and said, “I don’t have a good feeling about this game.” Which confirms that misappraising Matz wasn’t my only mistake of the evening. Louisville was ofer its opening six possessions. A couple of turnovers, a couple missed treys, a failure to convert a second chance, a missed floater after a sweet penetration. Truth be told, the errancy didn’t end there. Louisville played like a team with nothing to look forward to. Those gathered sat mum, like a fan base with nothing to look forward to. Both of which are fact, Jack. U of L made but one of it first 9 FG attempts. After a Trevor Cooney triple at 9:51 of the first, the somnambulant Cards trailed by a dozen, 6-18. A Quentin Snider trey, and another by Trey Lewis, playing his most mature game in the red & black, halved the deficit. Buckets by Damion Lee and Chinanu Onuaku further reduced the margin. David Levitch netted a long ball just :15 into the game. It was the prime factor that motivated the late arriving crowd to set down their cocktails, put away their cellphones and get involved. It was after that juncture that Matz put his imprimatur on the contest. But for the moment when Ray Spalding went down, and stayed down, and the L1C4 Nation feared he’d be joining teammates Anas Mahmoud and Mangok Mathiang in street clothes for the rest of the campaign, the second stanza was Fun in the Yum!. At the offensive end, the Cards drained 20/36 (56%) after intermission. Actually, the bulleyesmanship began in the first half. After that woeful 1/9 start, the Cardinals were 31/58 the rest of the way. That’s a glossy 53%. A sure sign of how well oiled Louisville’s offense was, how it flowed with purpose from side to side, and outside in, is this stat: 21 assists on 32 made buckets. Q had six assists, and turned it over only once. Damion, Nanu and Donovan had four apiece. Damion canned three triples in a row, pushing U of L’s margin to 49-40. After the ensuing media timeout, when Joey’s guys filled the stands with t-shirts and peanuts, came another 7 zed run. Donovan’s jackhammer slam was punctuated with a converted, second chance Chinanu +1, and a Trey Lewis layup, after he stole the inbounds pass. His team then down 15, 56-41, Boeheim, with full frontal frown, was forced to call a stoppage. It didn’t help. Nanu went highlight reel behind the back, hitting Lewis for a deuce. 60-44. Hammer Time continued. Johnson flushed a one hander after a beautiful feed. Then did it again. Mitchell added another slam. Both gentlemen have now officially qualified for Delta Omega Delta, the Doctors of Dunk fraternity. I loved how Damion Lee, as we’re wont to say, let the game come to him. After a 4 point, one board opening stanza, he finished with 15 and six. Nanu also kicked it in gear after halftime, finishing with a studly 13 points, 15 rebounds, those four assists previously cited, a block, a steal, and only two fouls. I loved that Trey Lewis kept the ball moving, dribbling much less than previously. I’m not sure what it means — other than Syracuse didn’t foul much — but U of L only shot two free throws. Before the Cards started disassembling ‘Cuse after the break, they were able to stay close, thanks to the visitors’ inefficiency at the line, where they hit less the 60%. Coming in, Syracuse had won five in a row, 8 of its last 9. The Syracuse players wore orange warmups with “Pearl” inscribed on the front. There are current efforts in the university community to raise funds to aid the former star guard, Dwayne “Pearl” Washington, who is suffering from cancer, and is said to be destitute. 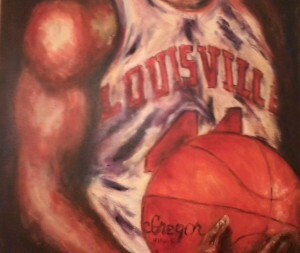 Louisville’s 1986 NCAA champs, which beat the Blue Devils for the title, shall be feted at the game. You can read my homage to that team here. Not being the type to gloat–much–about my man, the Applesause King, I am pleased to see your eloquent attempt to extract your Johnson & Murphy from your size 11 DD mouth. Too little too late, I am afraid. With that said, the true turning point of the game last night was when coach finally relented to the unspoken wishes of the assembled masses late in the first half and turned loose the “White Knights” to render the Orange asunder. The ‘Cuse pawns and General Bugger Nose had no answer– zero, nada–or the ability to handle the prickly combo or David L. and Matts S. If CRP would have had the stones to jointly unleash these highly trained assassins upon the Dukies or the Fighting Begonia’s last Saturday, I dare say we would be 11-2 and in first place in the ACC. But, I understand it is difficult to employ such dangerous weapons on unsuspecting civilians such as our brothers in the ACC, and such WMDs should only be used in combo when absolutely necessary to protect the Cardinal’s and the American Way, I suspect that in light of the recent clamoring of the disgruntled fan base, the Rick thought he had no choice but to Nagasaki the upstate New Yorkers to set them up for ultimate destruction and their total surrender that was memorialized by their effort, or lack thereof, in the second half. Not since the Vichy French met with Uncle Adolf in the same train car in which the German’s surrendered after WWI did a team, or nation, capitulate so completely and without any semblance of resistance. But, can you blame them? 3-4 more minutes of the White Knights together in the second half may have been more than any Cuse supporter or player could have handled. Water boarding would have been more humane. So, there you have it. Case closed. Motts Applesauce and his little buddy for All American honors, sooner, rather than later. Thank you, Ken…let the legions of Matz men step forward and share the Glory! Double technical on you guys. Flagrant 2. I get shots and the ball out of bounds. If this were football, you’d be flagged for piling on. I’d respond my completely to Counselor Joyner’s post. But Google Translator couldn’t decipher what he said, so I remain in the dark. Snarky is not becoming you know…. and here I thought that I was the first to tell him that Stockman would make us forget Wes Unseld and Charlie Tyra and Beau Zach Smith. I would never say, “I told you so.” So I’m putting it in writing. I’ve been waiting to use that all year. Rest easy, I don’t intend to get that cloyingly cute again.